(Washington, D.C.) –CityCenterDC, the 10-acre, landmark, mixed-use development located in the heart of downtown Washington, D.C. today premiered a new marketing and advertising campaign that reflects the vibrant, one-of-a-kind experience residents and visitors have when visiting the project. The campaign, all shot onsite at CityCenterDC, focuses on the energy, place and design that make up the three city blocks that have enlivened Downtown D.C. with world-class shopping, dining, and events. The tagline, “District of Joy,” is built around the five senses to show how the simple pleasures of everyday life become extraordinary at CityCenterDC. Whether shopping or sipping red wine, everything is more delightful, more delicious, and more joyful at CityCenterDC. “The concept behind The District of Joy is to transform your same daily routine into a new daily experience. The art direction for the film is inspired by the refined fashion and film of the days gone by; but for our interpretation there was no holding back. The best way to describe ‘District of Joy’ is that it’s a mash-up of the West Side Story and The Wizard of Oz! The District of Joy is a burst of visual experiences – colorful, bold, and full dancers to showcase the many unique offerings at CityCenterDC.” – Pum Lefebure. 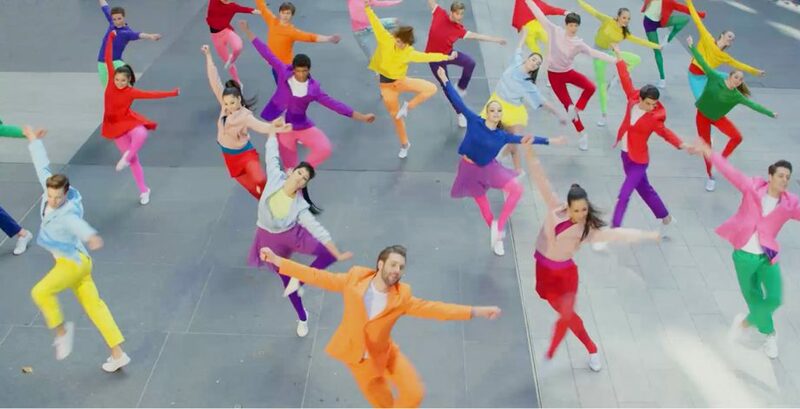 The focal point for the bright, whimsical campaign is a 2:00 minute video featuring local dancers from the Washington Ballet. Choreographed by Septime Webre, who served as artistic director of the Washington Ballet for 17 years, the video brings the “District of Joy” concept to life through a myriad of vibrantly dressed dancers experiencing all that CityCenterDC has to offer. The video is available to view on the newly refreshed CityCenterDC website (www.citycenterdc.com) and the campaign will appear in print, online, mobile and outdoor channels along the East Coast. CITYCENTERDC (www.citycenterdc.com) is a unique, pedestrian-friendly, 10-acre mixed-use development, located in the heart of downtown Washington, D.C., on a 4.5-block parcel bounded by New York Avenue, 9th, H and 11th Streets, NW. Developed by Hines and Qatari Diar, the project is home to more than 191,000 square feet of retail space, featuring a unique mix of local, national and international brands such as Hermès, Louis Vuitton, Gucci, Dior, Burberry, Loro Piana, Salvatore Ferragamo, Bulgari, CH Carolina Herrera, Paul Stuart, Allen Edmonds, BOSS, kate spade new york, Moncler, VINCE and more. Restaurants include Momofuku, Milk Bar, Del Frisco's Double Eagle Steak House, Fig & Olive, Centrolina and DBGB Kitchen and Bar. In addition, the project encompasses 520,000 square feet of prime office space, 458 rental apartment units and 216 condominium units, a 1,550 space parking garage, a public park, a central plaza and pedestrian-oriented streets and alleyways. CityCenterDC’s ceremonial entrance off H Street NW features The Gateway at CityCenter, one of the world’s largest and most breathtaking video art installations. Construction of the Conrad Washington, DC, a 370-room luxury hotel with 30,000 square feet of additional retail space, commenced in 2016. From its Washington, D.C. headquarters, Design Army is making its mark on the design world — and winning acclaim from clients and peers in the process. The multi-disciplinary firm has forged alliances with industry leaders and connected with global audiences. Their client list reflects a balanced mix of small businesses and international juggernauts, including The Academy Awards, Disney, The Broadway League, The Hay-Adams Hotel, Human Rights Campaign, Neenah Paper, The Ritz-Carlton, PepsiCo, Smithsonian Institute, University of Virginia, Washingtonian Magazine, and the Washington Ballet. Design Army's work has appeared every notable industry publication; including Applied Arts, Communication Arts, Graphis, HOW and Print Magazines. Additionally, the firm’s work has been recognized by the AIGA 365, American Advertising Federation, CLIO Awards, London International Awards, New York Art Directors Club, the One Show, Society of Publication Design (SPD), Television Academy (EMMYs) and the Type Directors Club to name a few. For a complete listing of their accolades and to see their work visit www.designarmy.com.